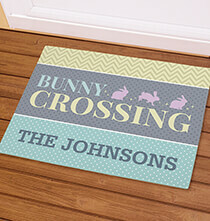 Welcome visitors to your home and protect floors with our collection of engaging personalized doormats and rugs. 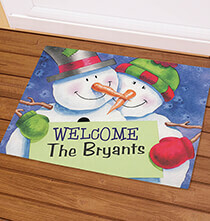 Find colorful doormats with graphics to personalize for year-round display and the Christmas holiday. When people step into an entryway or onto a porch they often don’t bother checking to see if the soles of their shoes are dirty. 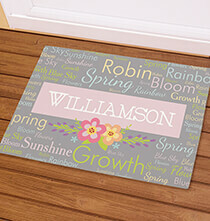 This can lead to indoor floors getting barraged with dirt, debris, mud and water, depending on the weather. 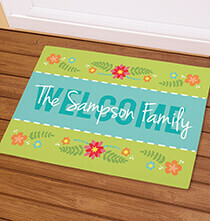 Placing a rug in front of the outside front door and in the indoor entryway can greatly reduce the sullying of clean floors. 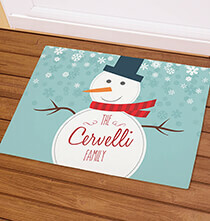 Our durable rugs are made of fleece, which gives them a soft low-pile surface to walk on. 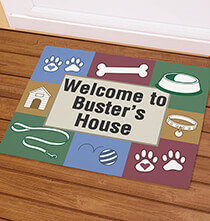 Additionally, our doormat rugs include strong latex gripping on back to keep them firmly in place. Maintaining your decorative fleece rugs is a simple matter of washing them with a mild soap and cold water and letting them air dry. Getting into the spirit of the holiday season often means decorating your home with an array of Christmas decorations. 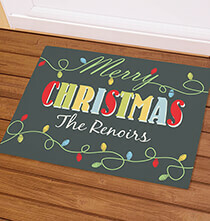 As you make plans for this year’s decorations, you can give your doorstep a seasonal makeover as well. 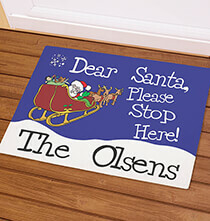 PersonalizedThings by Exposures offers a wonderful selection of decorative Christmas doormat designs for your home. 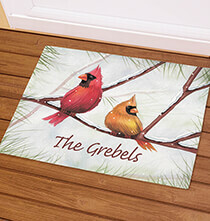 These doormats feature beautifully done graphics that resemble holiday greeting cards. 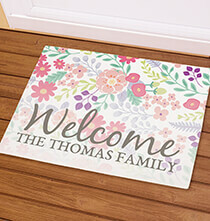 Some styles also include a cheerful greeting for visitors. 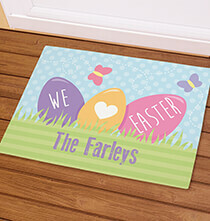 You can add your family’s name and/or any custom wording to your doormat to make it even more special. 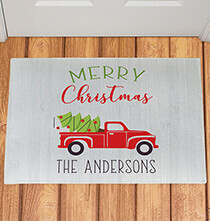 Choose one or more holiday doormat designs that blend with your Christmas decorations, or select them according to your creative preferences. 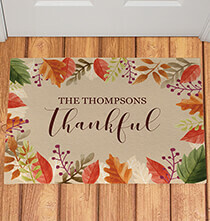 Change your doorstep and entryway rugs as often as you like thanks to our variety of year-round personalized rug designs. 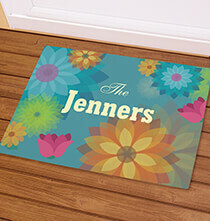 Our designs range from chic to humorous and they all include a personal name or message, making them uniquely your own.